Royal Canin Mini Adult Plus 8 Dog Food contains adapted content of nutrients to help maintain vitality in small breed dogs facing the first signs of ageing. Contains an exclusive complex of antioxidants to help neutralise free radicals. Helps maintain ideal weight in small breed dogs through promoting fat metabolism by L-carnitine and supports dental health with calcium chelators to help reduce tartar formation. Formulated with a selection of exclusive flavourings, it satisfies the appetites and health requirements of your ageing small breed dogs. Complete dog feed for vitality support, ideal weight and dental health. 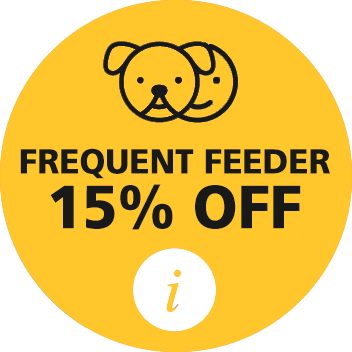 Complete feed for mature small breed dogs (adult weight up to 10 kg) over 8 years old. maize, rice, dehydrated poultry meat, animal fats, maize gluten, maize flour, vegetable protein isolate*, hydrolysed animal proteins, beet pulp, soya oil, minerals, yeasts, fish oil, fructo-oligo-saccharides, borage oil, green tea and grape extracts (source of polyphenols), marigold extract (source of lutein). ADDITIVES (per kg): Nutritional additives: Vitamin A: 22200 IU, Vitamin D3: 1000 IU, E1 (Iron): 47 mg, E2 (Iodine): 4.7 mg, E4 (Copper): 8 mg, E5 (Manganese): 60 mg, E6 (Zinc): 181 mg, E8 (Selenium): 0.08 mg, L-carnitine: 50 mg - Technological additives: Pentasodium triphosphate: 3.5 g - Preservatives - Antioxidants. ANALYTICAL CONSTITUENTS: Protein: 27% - Fat content: 16% - Crude ash: 4.7% - Crude fibres: 1.5%. *L.I.P. : protein selected for its very high assimilation. Jade says... Having a picky dog, finding a Premium for him was hard. Thankfully when we found Royal Canin he loved it. Great for mantinence of a healthy coat and have had no problems, a happy dog!